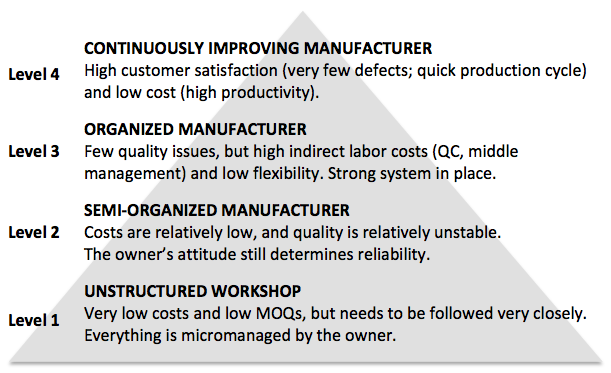 Level 4: that rare bird that applies lean manufacturing, and that avoids level 3’s rigidity. In this article I am excluding Chinese state-owned enterprises, which are a breed on their own. Count on other manufacturers or trading companies to get business. Result: very low costs and low MOQs, but needs to be followed very closely by customers. This category is a mixed bag. Some export 100% of their output and are very familiar with their market’s quality & safety standards. Others focus more on the domestic market or the most price-sensitive countries (Middle East, India…), and should be avoided by importers from North America and Europe. Result: costs are relatively low, and quality & timing are relatively unstable. The owner’s motivation for your orders still determines their reliability. Typical profile: 800+ workers, owner is often from Taiwan or Hong Kong. Customers’ IP rights are more strictly respected. I described this type of company in more details here. Result: few quality issues, but high indirect labor costs (QC, middle management) and low flexibility. Midsize factory with a process-oriented general manager. Staff is trained and supports the philosophy. 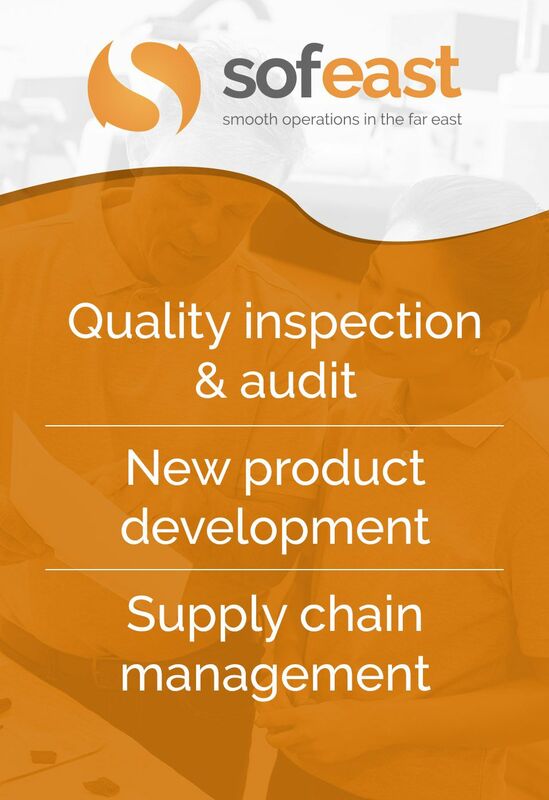 Result: high customer satisfaction (close to zero defects; production cycle below 5 days) and relatively low cost (high productivity of operators, limited QC staff and rework). Unfortunately, these companies are a very small minority. They usually don’t advertise themselves on B2B directories. They are very hard to find. 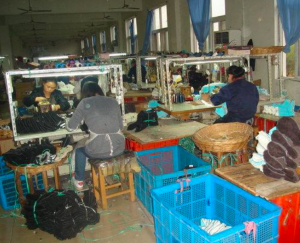 What kind of Chinese factories should you work with? If you work with a supplier that is too large relative to your orders (e.g. you would occupy 1% of their annual capacity), you will be quoted high prices and given poor service. If you work with a small supplier that cannot produce the quantities you order, they will be forced to subcontract production and you will probably be in for a disaster. If your orders are very small, you might need to work with a trading company that will place your orders in a level 1 factory and follow production. If your orders are large enough to work directly with a manufacturer, but not big enough to be interesting to big factories, go for level 2. If your order are considered large and even big companies actively fight for your business, go for level 3. If you are in a very quality-sensitive industry and you cannot afford even 1% of defects, spend time and search for level 4 (but you might not find any in your vertical). Excellent analysis, Renaud. I have encountered examples of each type. Unfortunately, due to my size, I tend to focus on #2 or, if lucky, #3. Usually #4 will not talk to me, even when I find them. It is never via b2b trade websites, almost always by sheer accident. Yes that makes sense. Thanks Callum. By visiting it. If you can’t visit it yourself, we can help you and audit it. See http://www.sofeast.com/factory-auditing/. Is this valid for every/any product? Good question. Yes, more or less.